Though for the cake, I followed her directions exactly. 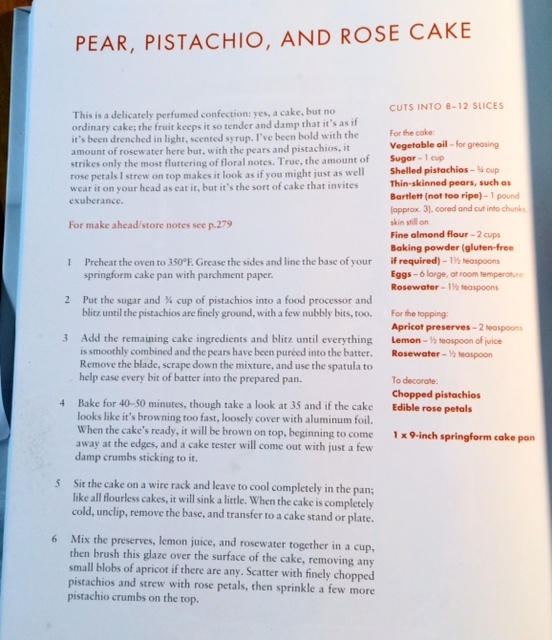 Recipes for cakes, and most baked goods are an area of cooking where it's important to respect the creator, at least for the first go around. Glad I did, as it turned out as promised, "a delicately perfumed confection." There are 3 pears ground up in there!! As well as almonds and pistachios. I had a group of women over and we all thoroughly enjoyed this floral delight. Bob too, as we saved him a piece. Luckily, I had just enough ground almonds in my freezer, so didn't need to improvise, grinding my own. Though whirring the pistachios up in the blender was easy enough. The whole endeavor was simply and easily done; made the day before and topped before serving. There was also a piece left for me the next day. Perfect with a glass of iced tea, a new favorite of mine, Numi's Chocolate Rooibos. 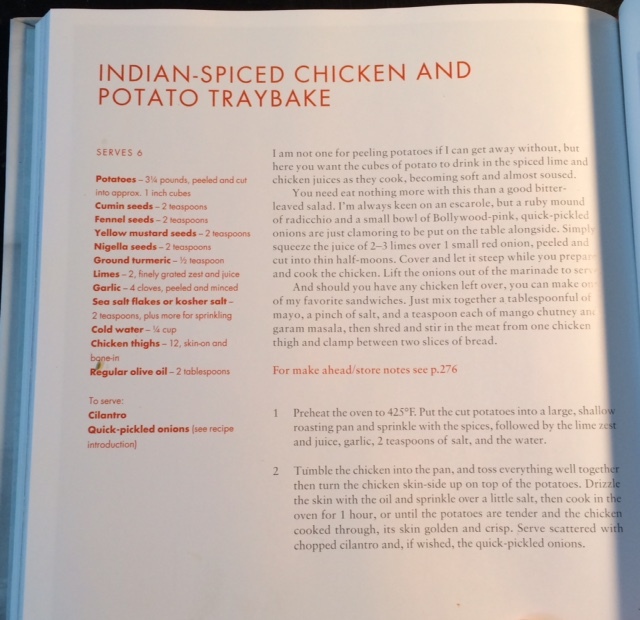 Her Indian-Spiced Traybake is a form of cooking I've heard called a sheet pan dinner. And probably what you, like me, just called a toss it together one pan meal. Simple, quick and very delicious. Can easily be adapted to what you have on hand. 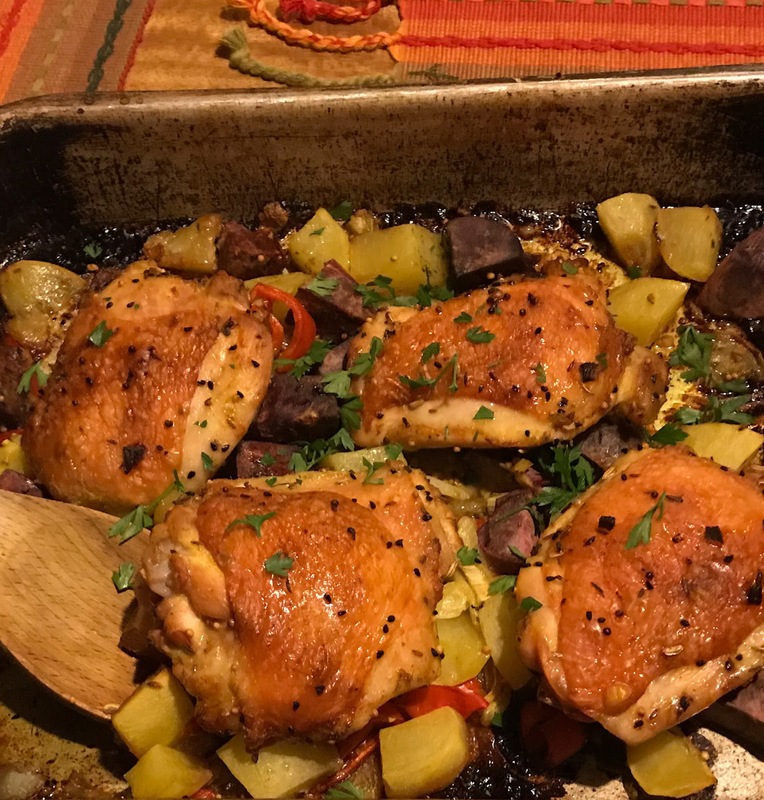 I added in extra sweet red peppers, and used half sweet potatoes from our garden along with the regular white potatoes the recipe called for. 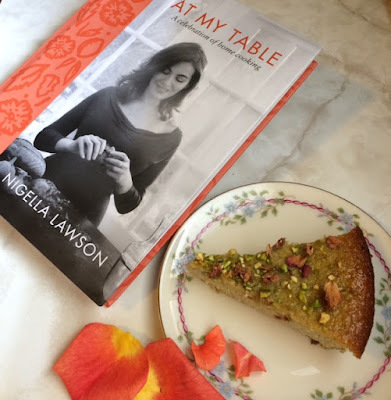 Nigella's combination of mostly whole seeds and spices in this was especially nice, including her signature nigella seeds, which I normally just use to top my bread. And the addition of lime zest and juice were just right, offsetting the unctuousness of the chicken. I'm sharing this post over at Beth Fish Reads for her Weekend Cooking event, and with the November Foodies Read Challenge, hosted by Heather. Be sure to stop by for good book suggestions, and some yummy food. The tray bake looks scrumptious, I love cooking like this. It's all in one pan. Great looking cake too! I checked that Nigella book out of the library as well. I love her. Your review makes this cookbook sound really delightful. Thanks. 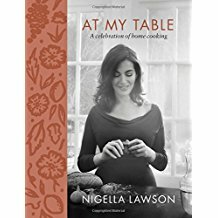 I bought a big container of nigella seeds -- glad to hear there's something I should do with them! Internet was down this morning, and I posted from my iphone, which messed up layout, however. If you are looking for another recipe from this book try the Carrot, Walnut and Ginger cake. Oh my goodness. So good!! I've made it a few times this year. 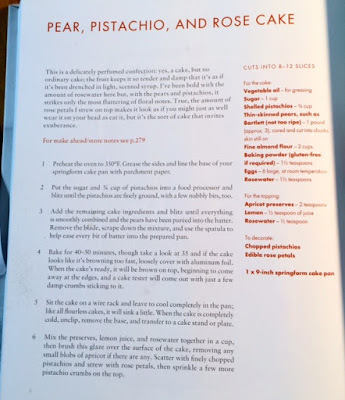 Oh shoot ... do I have to buy this cookbook? Both recipes, especially the chicken, sound great. And so does that cake Marg mentioned. 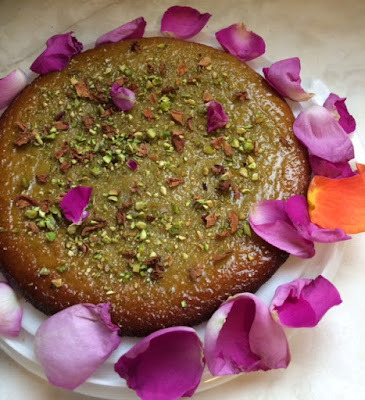 i love pistachio, will definitely love pistachio pear cake. 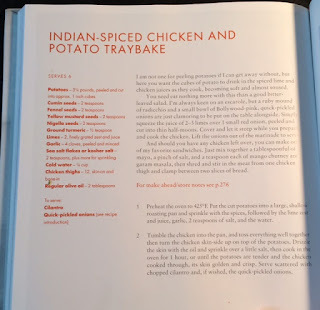 planning to buy this cookbook..